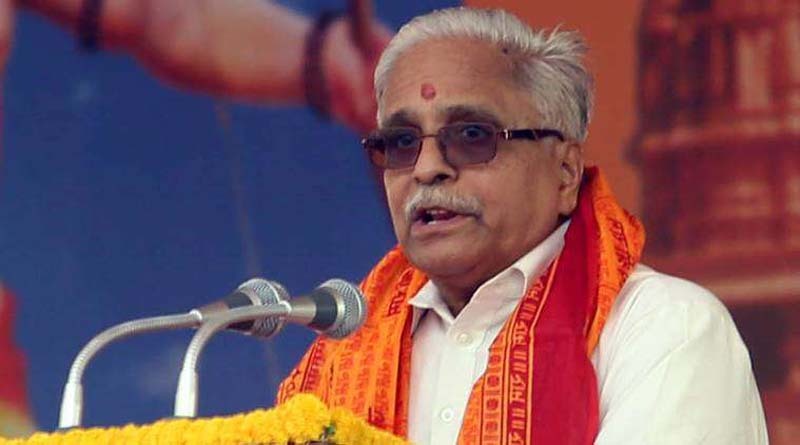 Two days before Parliament meets in its Winter Session, RSS Sarkaryavah Suresh ‘Bhaiyaji’ Joshi told a rally of Hindu religious leaders and their followers in Delhi that a law to build the Ram temple in Ayodhya was now the “only option”, and the “ruling dispensation” should deliver on its commitment. Hansdevacharya Maharaj, a prominent religious figure from Haridwar, told the gathering that the sants would not allow Narendra Modi to leave the post of Prime Minister before the BJP had fulfilled its promise to build the Ram temple. Sunday’s gathering was much bigger than the similar Dharma Sabhas that the Vishwa Hindu Parishad (VHP) has organised in Nagpur, Ayodhya, Bengaluru, and Mumbai in recent weeks to press for the construction of the temple in Ayodhya. The crowd, which senior Delhi Police officers said could be in the range of 1.5 lakh to 2 lakh-strong, choked the heart of the capital, and impacted traffic up to several kilometres from the venue of the rally in Ramlila Maidan. 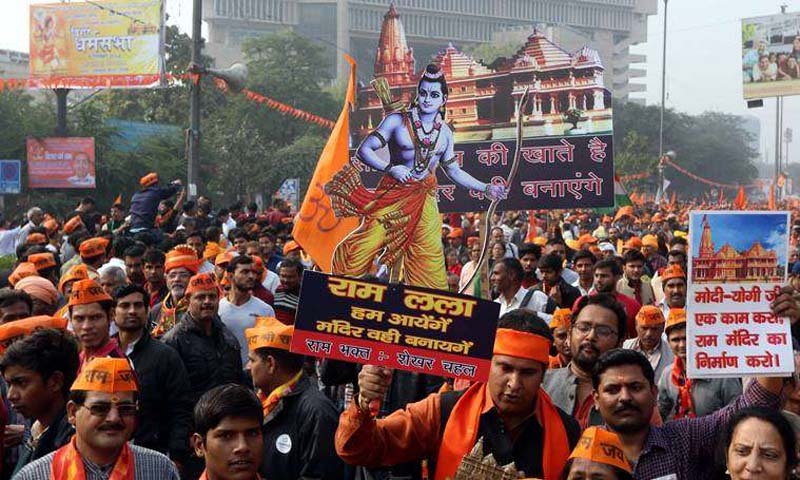 Participants wearing saffron caps and waving saffron flags climbed on to the roofs of buses, and raised slogans of “Jai Shri Ram” and “Ram Mandir wahin, Babri kahin nahi (Temple at the site, and no mosque)” both during the four-hour event and on the streets. The RSS, VHP and sants want to keep the pressure on the government as the Winter Session begins. The pledge by the participants at the Dharma Sabha to not let Narendra Modi leave before he has built the Temple, is a statement of support for him, even if put indirectly. In a democracy, “satta” (state power) is not supeme but it plays an important role, Suresh Joshi said in his speech to the Dharma Sabha. “Those who are at the centre of power need to understand this… They (the BJP government) have given a commitment to build a Ram temple in Ram Janmabhoomi in Ayodhya… Time has come to fulfill that commitment… Without any hesitation, they should move forward…,” he said. The government, Joshi said, “should take steps to enact a law as per the wishes of sants and Ram bhakts… No other alternative can be imagined… We are not begging, we are expressing our sentiment. We are sure that those who are in government today will understand this and take positive steps”. Joshi subsequently said, “There is only one option left. As the sants have said, a law should be enacted to remove the hurdles on the path of the Ram Temple.” The nation, and all communities and followers of all religions, wanted “Ram Rajya”, he said, and expressed hope that the slogans of “Jai Shri Ram” would be heard by the court, which would then understand the sentiments of the public. The movement for the Ram Temple would continue until the goal was achieved, Joshi said. Hansdevacharya said the Babri Masjid was a “black spot” on the map of India, which was removed on December 6 (1992). When the courts observed holidays on Ram Navami and Janmashtami, how could the judges defer the hearing on the Ram Janmabhoomi case saying it was not priority, he demanded to know. Hansdevacharya, too, called for either a law or an ordinance to build the Ram temple. No party could stop the construction of the temple in Ayodhya, he said. “We have to recover our debt from Modi. We warn Modi. We will not let you leave the post of PM until you build the Ram Temple,” Hansdevacharya said, and asked the gathering to take that pledge. VHP international president V S Kokje said the Temple could not wait indefinitely for the court’s decision. If Parliament made a law, it would not amount to insulting the judiciary, he said. Swami Chinmayanand appealed to the Supreme Court to not delay the hearing. But he also said that a division of the Ram Janmabhoomi site would not be acceptable. “We want the entire land and all of Ayodhya… there should be no new mosque in Ayodhya,” he said. He congratulated UP Chief Minister Yogi Adityanath on renaming Faizabad as Ayodhya. Sadhvi Rithambara said Adityanath had lit 3 lakh earthen lamps in Ayodhya and announced a massive statue of Lord Ram, but nothing would carry conviction till such time as Lord Ram remained under the tent in the makeshift temple. “Ram ka jo vyakti bhakt nahin hai, koi aur hai woh Hindu rakt nahi hai — jaanch uski hum karaa ke rahenge, Ram mandir banaa ke rahenge (He who is not a devotee of Ram is not a Hindu, we will ensure that this is tested, and the temple is built),” she said. On the issue of cow slaughter, Rithambara asked the crowd to “roar like lions and not bleat like goats”. VHP vice president Champat Rai said the Allahabad High Court had divided the land in three. “We do not want parts. We want the entire land. We will not leave even an inch of land. We want a law that gives us the entire site. I appeal to Muslims to withdraw their case for peace in the country,” Rai said.